$$$ KPO and CZM $$$: What is Happening to Singtel? Singtel (Singapore Telecommunications Limited) needs no introduction, it is a familiar name for everyone. Based on its latest results, it seems like it was an excellent year for Singtel at a glance. Record net profit + the whole year this up and that up, only Q4 down, why would the price keep falling?! It is currently at a 5 years low (based on ShareInvestor). Why? The record net profit is largely bumped up by the divestment on Netlink Trust which was recorded as an exceptional item (gain) of $1.93 billion. If we were to remove this gain from the record net profit of $5.45 billion, we will get $3,500 billion which is lesser than FY 2017 $3,853 billion. Once we adjust its net profit, it becomes more evident that Singtel is not trading as "cheaply"/undervalued as it is, with its previously inflated earnings/EPS. Using the given EPS of 33.40 cents would mean that some of you may compute Singtel PE as ~9.79 (3.27 / 0.334). Realistically, the adjusted EPS should be ~21.42 cents giving a PE of 15.27 (3.27 / 0.2142). Not so surprising as to why the price has fallen so much anymore right? So why did we buy more Singtel? There are actually many many reasons. lol. Firstly, I took some time to compile the financial numbers for the last 5/6 years to compute its PB, PE and dividend yield based on the closing price one day after the full year result was announced. Although PB is not relevant for Singtel, it is still worth noting that at the current price, Singtel is trading below its average and median PB and PE since 2013. In addition, Singtel has "promised" to maintain dividends at 17.5 cents for the next two financial years. The price which we entered ($3.30) meant that we would be getting a dividend yield of ~5.3%. The next question to ask is will the dividends be sustainable? If you were to look at its FCF (Singtel Free Cash Flow = Net cash from operating activities - Payment for purchase of property, plant and equipment), you will see that its FCF is still relatively healthy and the dividend payout ratio is below 1. Hence, the dividends are in fact very sustainable. 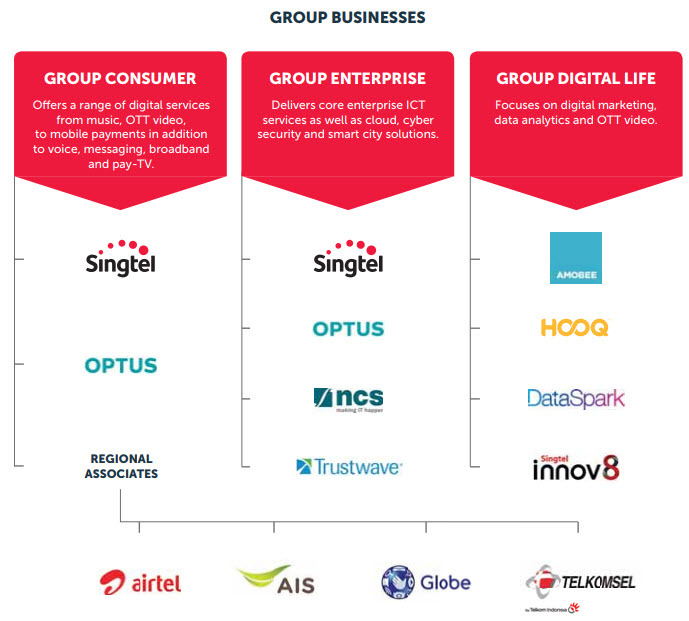 Singtel businesses can be broken down into the above 3 groups - Group Consumer, Group Enterprise, and Group Digital Life. 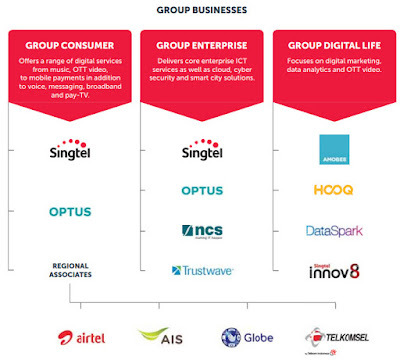 The general public impression of Singtel business is from the Group Consumer (the mobile, broadband, etc.) which contributes the most revenue, is unfortunately declining and facing fierce competitions. One example is Circles Life who recently launched a Flexi Plan for $0?! Looking at the breakdown of the revenue, we can see that Singtel is trying to move the dependency of its revenue from the Group Consumer business by growing the other 2 businesses. It is also interesting to see the huge growth in the revenue of Group Digital Life (~100%) but I am pretty puzzled as to why it is still making losses (2013: make $111, lost $145. 2018: make $1,080 but still lost $120?!). The declining revenue/net profit of its businesses is the main cause of the drop. Last but not least, are you familiar with the saying that banks that are too big to fail? Going by this logic, Singtel being larger than 2/3 banks would similarly be too big to fail. lol. I am serious! Look at the top 2 substantial shareholders! Hahahaha. On a side note, KPO started working on a new project to ingest stocks data in order to increase his efficiency in screening stocks, remove the typical limitation of 3/5 years stock data and to visualize them. The dashboard that I have created is still at its infant stage but looks cool enough for now. lol. If you believe in mean reversion, Singtel current share price ($3.27) is way below its mean price of $3.799 using data from 2013. However, the mean price will always be limited/affected by the dataset that is available and the timeframe used for computation. In comparison, SPDR STI ETF (ES3) is trading above its mean price since 2008. Time to sell? lol. Hope Singtel don't kena KPOUN-ed! Hahahaha. I think it already did. That's why it was at 5 year low! 话不可以讲太快. "科普" some more gg liao! Hi kpo, interesting project for stocks data you have there! Is it available for sharing/tweaking? Thanks! Unfortunately, I do not think it is ready for sharing yet and to share it means I need to spin up a server, host the data and application as compared to me running it locally. I guess the more cost effective way of sharing now is to share screenshot in my articles like the above once in a while? Hahahaha.